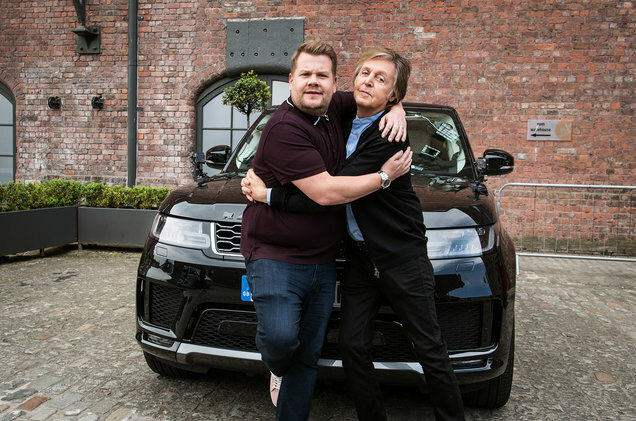 James Corden has had a number of superstar musicians in the passenger seat over the past few years in segments, including Justin Bieber, Adele, Carrie Underwood, Jennifer Lopez, One Direction, Madonna, Foo Fighters and Kelly Clarkson. But during next week’s special series of Late Late shows taped in his native England, he’s promising some official music royalty. “I can’t wait for you all to see this,” Corden tweeted on Wednesday morning (June 13). “It was a day that will live with me forever.” The tease includes a retweet from the show that confirmed reports that Sir Paul McCartney will slide into the left-hand passenger seat for a round of “Carpool Karaoke” next week during the four-night sojourn in London, complete with the photo of th two men hugging.